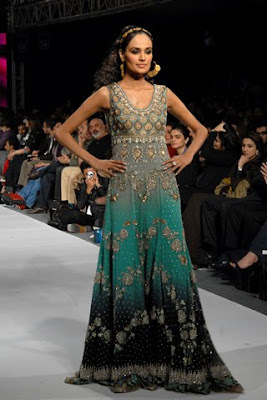 With so many designers (32 in total) and hundreds of photos, I couldn't post ALL of the shows from the 2010 PFDC Sunsilk Fashion Week, and thanks to the extensive coverage of this event by dedicated Pakistani fashion site Fashion Central, I don't really have to! But here are some outfits which I thought were interesting...for good reasons and bad. Links to view the full collections are included. Shaiyanne Malik I'm liking the hot pink in these two outfits, view the rest of the collection here. 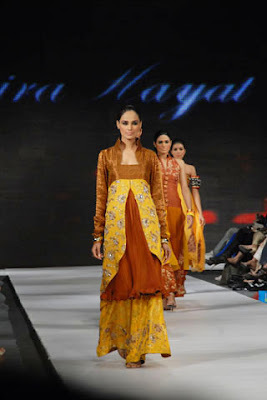 Hajra Hayat This collection was all about bronze, gold, mustard, yellow and orange tones, click here for a closer look. Sarah Salman Too many ruffles? I do like the shoes though, they remind of this pair available in the UK from Faith. Click here for the rest of the Sarah Salman collection. 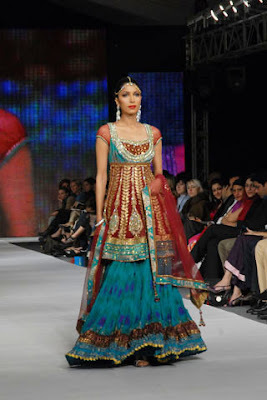 Rehana Saigol Click here to view more from Rehana Saigol. 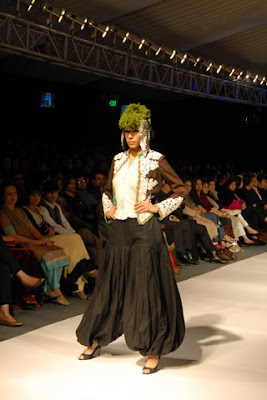 Nida Azwer Click here to view the rest of Nida Azwer's collection.